Three Virginia teams won their first state championships Saturday at Great Meadow, while two regulars kept their annual appointments on the podium. 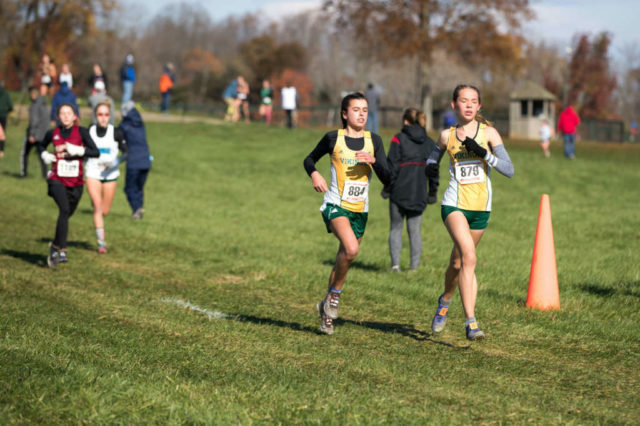 Tuscarora girls and defending national champion Loudoun Valley boys repeated as team champions in 5A and 4A, respectively, but Loudoun Valley and West Springfield’s girls an W.T. Woodson’s boys (6A) were both new to hoisting a trophy. LV’s Sam Affolder repeated and his teammate Ricky Fetterolf won her first individual title. Three Northern Virginia runners finished in second: Broad Run’s Ellie Desmond in 5A, and West Springfield’s Chase Kappeler and Woodson’s Jack Leech in 6A. Jack Leech takes the lead from Chase Osbourne (in blue). W.T. Woodson’s boys overcame a strong pack of West Springfield runners up front to edge the Spartans by six points in the 6A race, 72-78. Oakton was third with 103 points. Great Meadow, The Plains, Va.
Woodson senior Jack Leech finished second behind Western Branch’s Chase Osborne to start off the scoring, edging WS junior Sam Pritchard, but Pritchard’s teammates Chris Weeks (seventh in 16:34) and Sean Stuck (ninth in 16:38 ) finished close behind. Senior Aslan Azar took the pack through most of the first half mile, the cold headwind numbing his body to the pain. Leech was on board with an aggressive early pace. The problem was that the plan was for him to wait for the last half mile to make his move. Western Branch’s Chase Osborne did as his first name would suggest and made a decisive move in the third mile, attacking up and down the hill leading to the final stretch. “I tried to go hard on the hill too,” Leech said. “I felt good. Then I felt really bad. “He put on the jets and pulled away,” winning in 15:55 while Leech came in at 16:06, 18 seconds ahead of Pritchard. “I just waited for the boys to come in, like it Christmas morning,” he said. 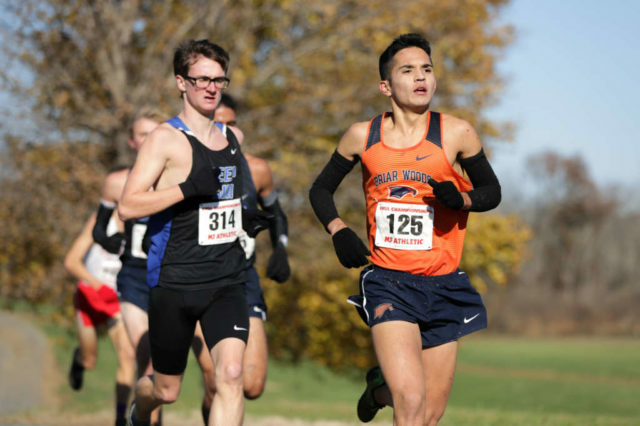 John Leal finished in 16th, running 16:45, close enough to West Springfield’s top three that he felt pretty good about his finish, despite being a place away from all-state honors. Then Azar finished, running 16:54 for 26th place.. Tyler French, who recovered from a second-mile fall, was 30th in 16:57, followed by Bobby Johnson in 17:00, in 33rd place overall. The Spartans’ number four, Matthew Foote, edged Alejandro Posadas-Nava, who, with Ethan Callahan, managed to put two displacers in front of West Springfield’s fifth, J.J. Comley. 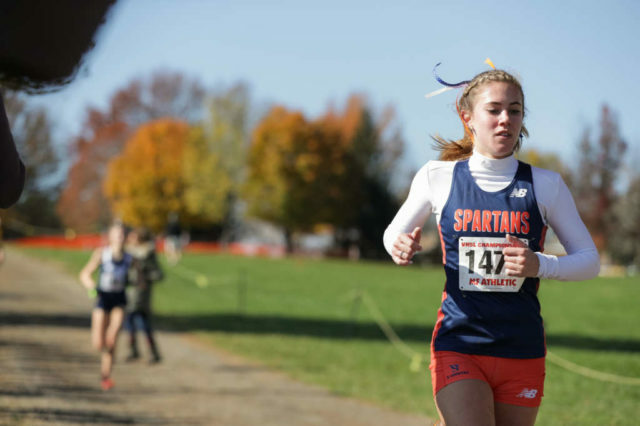 Losing the regional meet to West Springfield hurt, but Coach Dave O’Hara told the team to trust their progress and the change to race in a bigger field, where the gap between the Spartans’ runners would grow. The championship was a capstone for O’Hara, who came to Woodson from Annandale four years ago, starting with the program at the same time as most of his top seven. Five of them are seniors. Pritchard was thrilled with his third place finish. “It went better than I hoped it would,” he said, noting that his realistic goal was to finish in the top 10. “I started moving up in the second half and felt good doing it, which I didn’t expect. I was in third at the top of the two-tier hill. I knew I had guys right on me and I had to hammer to stay in third. Chase Kappeler led the way for West Springfield in second place. A year after fading on the last stretch, West Springfield’s girls put a healthy margin on Colonial Forge, winning 54-10. Last year’s defeat, which came in the last half mile, prompted the Spartans to take a different approach. She explained her execution matter-of-factly. It wasn’t that easy. In the days leading up to the meet, she figured she would finish later in the top 10. What she didn’t expect was Annandale sophomore Julia Ghiselli, while maintaining a healthy lead, blacking out 40 feet from the finish line, recovering and finishing fifth. Ghiselli was up and about for the awards. But that left first place for Colonial Forge’s Mckenzi Watkins, who ran 18:49. Kappeler finished four seconds later. Among the other Spartan runners exorcising demons from last year’s race, junior Katie Orchard (22nd in 19:47) played a big part in rallying the team. She raced last year’s state meet with a fever and ultimately lost dozens of places in the last stretch. Junior Amy Herrema finished 18th in 19:42, and senior Helen Heaton, whose ankle injury was initially diagnosed as broken foot, returned to finish 38th in 20:12, two places and three seconds ahead of senior Haley Seaward. Senior Sarah Coleman, however, was not able to race. Shortly after returning from a stress fracture in her tibia, she ruptured the arch of her foot during a race. Days before the race, she remarked that the silver lining of her injury was that it instilled new vigilance in her teammates to be mindful of aches and pains and ensure they get enough rest. George Marshall senior Natalie Bardach finished third in 18:55, a year after struggling with injuries. She wound up with a four-second lead on Yorktown sophomore Piper Dean. She had no ambitions of realistically finishing that high at the state meet when the season began, but her fourth place finish at the Third Battle Invitational and win at the National District championship helped her reevaluate her goals later in the season. She also won the Northern Region championship. “I knew I just had to go out and not be afraid,” she said. Following four straight 4A runner-up finishes, Loudoun Valley’s girls brought home the team’s first title. Sophomore Ricky Fetterolf won the individual title that alumna Natalie Morris had won a year earlier, also over Blacksburg’s Kaitlynn Wolfe. Elise Abbe followed in third in 18:40. She relies on positive thinking and self-talk to keep herself motivated, and her races over the past month brought her to the point where she felt like she belonged at the front. Harnessing that positivity has been key for her this season, Coach Marc Hunter said. It was almost a little too much. The Vikings put six runners in front of Blacksburg’s fifth, which gave them a little bit of breathing room after Blacksburg has three runners finish in the top seven. Sophomore Ally Talley was 11th in 19:36, senior Caroline Bolen was 17th in 19:56, sophomore Abbey Keane and junior Leah Snyder were 25th (20:13) and 26th (20:14). In 2014 (while in 3A) 2016 and 2017, Blacksburg finished ahead of Loudoun Valley. In 2015, Heritage won the 4A race ahead of Valley. The coaching staff saw potential for a state-winning team at the end of the 2017 season. Hunter said Tally’s addition served a purpose beyond her athletic ability. Hunter likes the girls’ chances to advance to advance to the Nike Cross National meet. Sam Affolder leading the field. 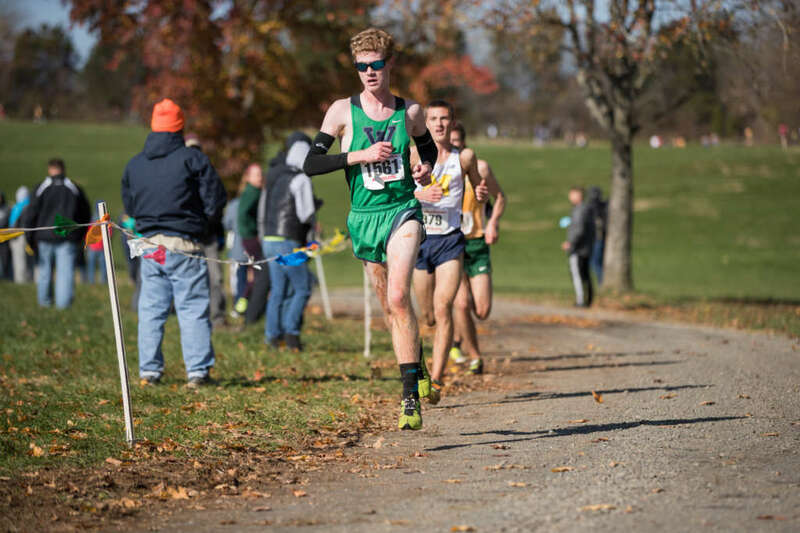 Though Loudoun Valley did not repeat its 1-5 finish from last year’s 4A race, the Vikings put their entire top seven among the top 10 finishers and swept the top three places, with senior Sam Affolder repeating as the individual champion in 15:30, the fastest time of the day. Senior Jacob Hunter and junior Kellen Hasle finished second (15:57) and third (16:00), with senior Connor Wells repeating his fifth place finish from 2017 in 16:07 and junior Pennsylvania transplant Carlos Shultz in seventh in 16:22. Junior Taylor Nay finished ninth in 16:67 and senior Jacob Windle was 10th in 16: 28. Incidentally, in the 3A boys’ race, Western Albemarle was 80 percent of the way to matching Loudoun Valley’s perfect score, but didn’t have a fifth man fast enough to complete the sweep. 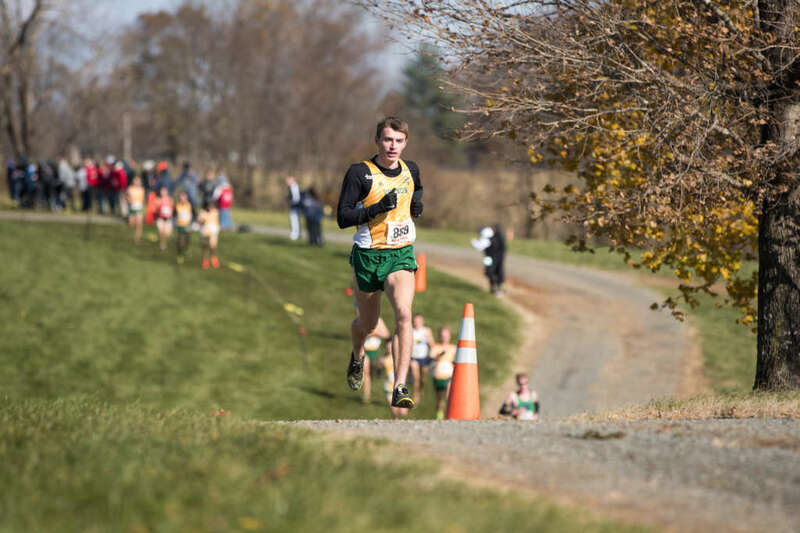 With individual Rylan Pettit from Woodgrove (fourth in 16:00) removed from team results, Loudoun Valley scored 16-97 over second-place Midlothian for the boys’ fourth straight 4A title. His 15:30 finish was the fastest of the weekend, and his 27 second margin of victory was also the largest. With his win last year, a wins by alumni Peter Morris (2016) and Drew Hunter (2013 and 2014 in 3A, 2015 in 4A), a Loudoun Valley boy has won an individual title the last six years. The messy course gave Affolder a chance to practice for the Viking’s intended cap to the season, Nike Cross Nationals. The course in Portland is notoriously muddy. Loudoun Valley will try for its second straight Nike Cross Nationals qualification Nov. 24. Marc Hunter said the boys have basically been on “autopilot,” due in large part to their experience over the last year. “They’ve been to the biggest race in the land, they’ve been successful, what can I tell them that they don’t already know,” he said. That self sufficiency reached the point where the team did not need to have a pre-race meeting, with no need for any motivation beyond the opportunities in front of them. “There’s nothing that’s really challenged them during the season. The coaches are thinking ‘nationals,’ the boys are thinking ‘nationals,’ so w just have to get through the season and get to the postseason. Now that the races are starting to mean something they’re getting excited. Ellie Desmond leads 5A winner Lilly Snow. Tuscarora repeated as 5A champions, their fourth title in five years. Senior Ava Hassebrock led the way in seventh place, running 19:18. Deep Run’s Lily won the ran in 18:51 over Broad Run junior Ellie Desmond’s 18:54. Hassebrock didn’t run the Potomac District meet and the Huskies came in third, but the team rebounded at their region meet to hold off a Briar Woods team of six sophomores and freshmen, then, like Woodson in 6A, took advantage of a larger field to put more of a gap on the Falcons. Nine of the top 10 runners returned for the Huskies, and four of the top seven from this year’s team will graduate having been a part of three state championship teams. Junior Katie West finished in 19th (20:05), senior Amber Douglas was 28th in 20:28, junior Emma Hunt was 32nd in 20:31, senior Sarah Gould finished 35th in 20:39, senior Katherine Russell was 44th in 20:53 and freshman Callie Lashey finished 62nd in 21:21. 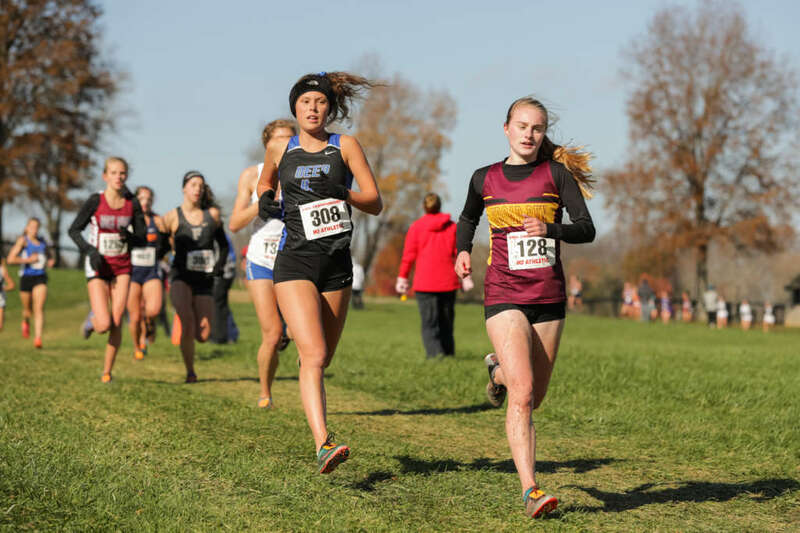 Broad Run junior Ellie Desmond broke 19 minutes on the state meet course, but that was the extent of her satisfaction after finishing second to Deep Run’s Lily Snow. A lack of summer training meant she spent August and September trying to catch up, and that fitness kicked in after a few months. She’s hoping for a personal record at the Foot Locker South regional race Nov. 24. Briar Woods senior Juan Moscoso with 5A winner Colby Burcham. 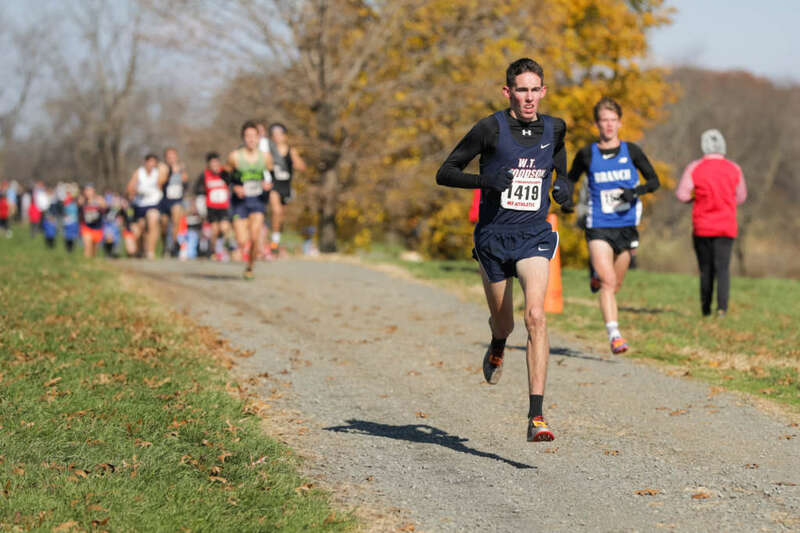 Freedom led the local boys’ 5A finishers in fifth place, with Stone Ridge eight points back. Individually, Briar Woods senior Juan Moscoso led the way for local finishers. A transplant from Orlando less than five months ago, he has been challenged both by the hills in Virginia and the cold that has defined the last month of cross country season. He was in second for most of the race until the climbs in the third mile took him out of the front pack. And he has not warmed to the dropping temperatures. “I’d rather be too hot than too cold,” he said. Friday’s races featured the schools in the three smallest enrollment classifications. Brentsville District was the D.C. area’s lone competitor in the 3A races, finishing fourth in the girls’ race with 144 points behind Hidden Valley’s 25. Junior Abigail Seigel’s 11th place finish in 19:28 behind winner Kasandra Aulenbach’s (Tabb) 18:41 led the Tigers. The boys’ eighth place finish with 185 trailed Western Albemarle’s 21 points, with junior Andrew Rice finishing 22nd in 16:46. Winner Joe Hawkes of Western Albemarle ran 15:39. George Mason finished eighth among 2A girls teams with 160 points behind Clarke County’s 51. Junior Jo Sevier ran 20:57 for 25th place and Maggie Walker’s Mary Caroline Heinen won in 18:25. Mason’s boys finished fourth with 112 points behind Maggie Walker’s 34 points. Sophomore Colson Board finished 13th in 17:25. Winner Oliver Wilson-Cook from Staunton’s Robert E. Lee High School broke the tape in 16:12. At Fork Union Military Academy, Bishop O’Connell senior Max Greczyn won the Virginia Independent Schools championship, running 16:48 to edge Cape Henry Collegiate senior Owen Richards and lead his team to a second place finish behind St. Christopher’s. Freshman Katherine Slovak led O’Connell’s girls to a second place finish behind St. Catherine’s with her fifth place finish in 20:31. Woodgrove senior Rylan Pettit finished fourth in the 4A race.